Over the holidays, I was listening to a podcast I’m subscribed to (namely The Morning Stream) and the hosts were talking about the music from Hamilton and how much they enjoyed it. They rounded out the conversation with how it was available on Spotify and iTunes so I got to thinking if it was also available on Amazon Music. If it was, I would listen, if not, I’d look into streaming via Spotify. With luck, the album is currently available on Amazon Music so I decided to give it a listen, especially since i heard that the music is a good mix between Hip-Hop lyrics and performance style background music. Listening to the soundtrack a couple times through now, I can say that I can see what all the positive reviews and press has been about. The music is fantastic, the story is told well and overall is so engaging that it is easy to listen through in very little time. 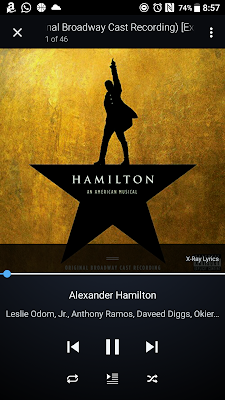 I highly recommend listening to the soundtrack if you can’t see the show, because it is a very good way to get the Hamilton experience and support the group at the same time. The soundtrack is available on the services I mentioned already as well as on Google Play so it is easily accessible on most platforms.